Three years since the first seeds were planted and Camp Doogs has grown into a fully-fledged habitat for music, art and outdoor recreation. Smack bang in the centre of the universe (WA’s Great South West), it’s the ultimate field trip: a real good camp. Camp Doogs is not just a music festival. It’s an immersive, elusive experience: a place to meet your spirit animal, to find your inner chill. There will be music though and deep doogs dancing to match. There’ll be unique installations, birdsong collaborations and riverside recitations. Cheesy daytime activities make way for late night mysteries. Fall asleep against a tree. Wake to a love note in your hand. Refresh with a morning swim before doing it all again. With no prior lineup announcement, and Nick Allbrook, Kucka and Peter Bibby as alumni, Camp Doogs 2015 anticipation will be high. Keep in mind it’s a festival big enough to attract international acts and small enough for giant spin the bottle. Explore your wildest fantasies; doogs do come true. Tickets include a bus to the site, a nature reserve near Nannup, so pack light and with the environment in mind. Food is available from local suppliers and drinks are BYO. Bring your swag. Bring a tambourine. Expect a great community and a drove of future mates. Read on. Buy the ticket, take the ride. Pugs not drugs. Hugs not thugs. Friday the 9th until the Sunday the 11th of October. In an enchanting natural reserve 3-ish hours south of Perth, nestled deep in the Great Southern. Hop on the bus and free your mind, mane. Coming with 1-2 friends = plenty... 10-15 = cool your jets. Yep, but NO GLASS and a deep sense of CALM in your consumption, please. Why don’t you announce acts? Ray Mysterio body slams Rick ‘PR’ Flair from the top ropes everytime. Are there any media passes? Nope. Soz. Sling us an email and introduce yourself. We’re always looking for new friends. What camping supplies do I need to bring? Optional: Cheese yoga attire, multi-generation family members, romantic aspirations. Prohibited: Firearms, relatives of Tony Abbott, pets or animals, winnebagos or generators. What is provided at the camp? Rotto vibes, sans Pinky Beach hang-overs. We got heaps of buses tho! Buses will leave from a central location in Perth. Bus ticket is included in ticket price. Toot toot! Limited number of Car Poole packages available, slide into the ticket section and check it out. Nah, mane. Nine out of ten dentists recommend you stock up on some scroggin’ or trail mix, then Anthony-Bourdain-it-up at the food trucks. Food truck instagram opportunities seized at Camp Doogs 2014 included alfresco 10/10 fresh juice, Brazilian & Soul Food spicy guys, local organic farm whole foods and curries, Charlie the Californian ambassador to the South West’s wood-fired pizza, coffee good enough for Tony Soprano & more. My band wants to play! Kewl, cobber. Sling us a vid or some audio! Then make some borsch, start a worm farm, swim some laps at Beatty Park, learn some spanish, have a cuppa with your Grandma, be yourself, repeat. This year at Camp we’re introducing a new stage known as Wild Doogs. Not all music best suits the colossal amphitheatre of the Gondwana main stage, the throbbin’ gristle of Deep Doogs or the Huckleberry Finn of the river “stage”. If you have a project that can fit in a tiny space (no drum kits), are 2015 ticket-holders and haven’t won anything in the past month call campdoogs@gmail.com and you could serenade/mindbend/freakout an intimate small audience in this microgasm of an experience. Stand Up Comedians also welcome please. 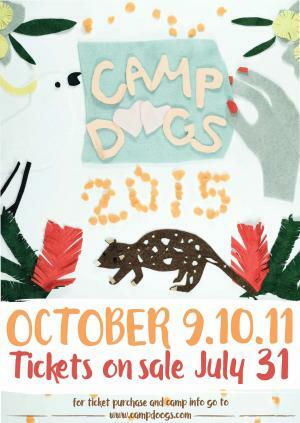 Buying a carpool ticket is the only way to drive to Camp Doogs. The space is very small, as well as a bush sanctuary so we want to keep vehicle numbers to a minimum. If you arrive via car without a car pooling ticket you will be turned away. The car pooling ticket entitles yourself, 4 others, and 1 average sized car to enter the site. No buses, trucks or camper vans will be allowed to enter the site. Please ensure you plan your trip to Camp Doogs well in advance. If you choose to carpool there will not be room for you on the bus. We cannot swap carpool tickets for bus tickets and vice versa. © 2019 Ticketbooth on behalf of Good Times Arts Inc.. All sales are final. Tickets are non-refundable.